This paper is not intended to prove that William Shakespeare never existed; only that the Stratford actors name and identity was used as a screen for a different man. It sounds preposterous when you first here it, after all, who wouldn't want to take credit for such brilliant work and gifted writing, right? I will only explore some of the many claims and theories regarding the Shakespeare identity controversy, and point towards a few facts which seem to indicate that Sir Francis Bacon was the real author behind Shakespeare's work. More than twenty thousand books and articles have been written about the "identity problem" regarding William Shakespeare. The more I read about it, the more suspicious about Shakespeare, as the true source of origin, I become. Much of the information I have collected come from Manly Palmer Hall, an initiate freemason, who in 1928 wrote the book "The secret Teachings of All Ages" where he on only four pages of his book browse this subject. Manly Palmer Hall writes: "There are in existence but six known examples of Shakspere's handwriting. All are signatures, and three of them are in his will. The scrawling, uncertain method of their execution stamps Shakspere as unfamiliar with the use of a pen, and it is obvious either that he copied a signature prepared for him or that his hand was guided while he wrote. No autograph manuscripts of the "Shakespearian" plays or sonnets have been discovered"
Manly Hall states that it is quite evident that William Shakespeare couldn't unaided, have produced the writings. For one he didn't possess the necessary literary knowledge. He states that the town of Stratford didn't have a school capable of passing on the "higher forms of learning" that are reflected in the writings ascribed to him. His parents were illiterate, in his early life he had a total disregard for study and he never travelled outside of England. To understand why Sir Francis Bacon is mentioned as the source of Shakespeare's work, one must understand the order of the Rosy Cross or the Rosicrucian's. According to the material I have read, most evidence seems to point to hints within the work itself. Hints only an initiate of the Rosicrucian's would have knowledge about, such as cryptographic symbolism, numerology, hidden watermarks and recurring miss-paginations thru the Shakespearian folios. Evidently there are also supposed to be hints in other seventeen century volumes that emphasize these claims. Manly Hall writes: "The philosophic ideals promulgated throughout the Shakespearian plays distinctly demonstrate their author to have been thoroughly familiar with certain doctrines and tenets peculiar to Rosicrucianism; in fact the profundity of the Shakespearian productions stamps their creator as one of the illuminati of the ages." Apparently scores of volumes have been written just to establish Sir Francis Bacon as the real author of the work of William Shakespeare. Hall states that an impartial consideration of these documents cannot but convince anyone who has an open-mind regarding the authenticity of the "Baconian theory". He says that all those enthusiasts who for years struggled to identify Sir Francis Bacon as the true "Bard of Avon" could have won their case only if they had emphasized its most important angle, namely, that Sir Francis Bacon, the Rosicrucian initiate, wrote into the Shakespearian plays both the secret teachings of the Fraternity of the Rosy Cross and the "true rituals of the Freemasonic Order". Manly Hall writes: "A sentimental world, however, dislikes to give up a traditional hero, either to solve a controversy or to right a wrong." The religious, philosophic, and educational messages all reflect his personal opinions. Similarities in style and terminology exist in Bacon's writings and the Shakespearian plays. Sir Francis Bacon possessed the range of general and philosophical knowledge necessary to write the Shakespearian plays. He was a lawyer, an able barrister and a polished courtier and possessed the intimate knowledge of parliamentary law and the etiquette of the royal court revealed in the Shakespearian plays. Manly Palmer Hall writes: "Sir Francis Bacon knew the true secret of Masonic origin and there is reason to suspect that he concealed this knowledge in cipher and cryptogram. Bacon is not to be regarded solely as a man but rather as the focal point between an invisible institution and a world which was never able to distinguish between the messenger and the message which he promulgated. This secret society, having rediscovered the lost wisdom of the ages and fearing that the knowledge might be lost again, perpetuated it in two ways: (1) by an organization (Freemasonry) to the initiates of which it revealed its wisdom in the form of symbols; (2) by embodying its arcana in the literature of the day by means of cunningly contrived ciphers and enigmas." To emphasize this Manly Hall return to the claim that there is evidence that points to the existence of a group of wise and illustrious Fratres (brothers) who took it upon themselves to publish and preserve, for future generations, secret books of the ancients, together with documents. So that future members of their fraternity not only can identify the volumes but also "immediately note the significant passages, words, chapters, or sections therein". He states that they created a symbolic alphabet of hieroglyphic designs. "By means of a certain key and order, the discerning few were thus enabled to find that wisdom by which a man is "raised" to an illumined life." In the beginning of the chapter Hall writes: "The present consideration of the Bacon--Shakspere--Rosicrucian controversy is undertaken not for the vain purpose of digging up dead men's bones but rather in the hope that a critical analysis will aid in the rediscovery of that knowledge lost to the world since the oracles were silenced." 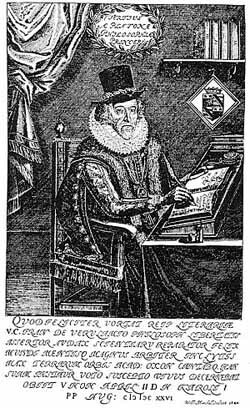 ..."Lord Bacon was born in 1561 and history records his death in 1626. There are records in existence, however, which would indicate the probability that his funeral was a mock funeral and that, leaving England, he lived for many years under another name in Germany, there faithfully serving the secret society to the promulgation of whose doctrines he had consecrate his life. Little doubt seems to exist in the minds of impartial investigators that Lord Bacon was the legitimate son of Queen Elizabeth and the Earl of Leicester"